While our phase one goals in our quick office makeover are completed, we have one small item we'd like to finish before we officially move onto other projects. The large fan in the center of the room sticks out like a sore thumb. It's shiny brass, sports dark stained wood blades, and seems to be a rather imposing and dated feature of an otherwise bright and cheerful room. To make matters worse, we rarely use this fan and the room is really dark without any overhead lights. 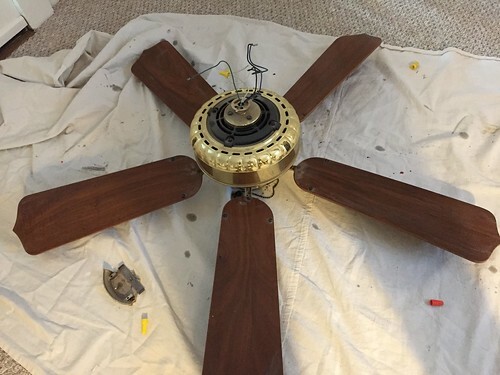 Our initial thoughts involved keeping the fan by disassembling it and painting it white. We were committed to this plan to the point where we purchased a can of spray paint, took the fan down, and set it on the ground so I could start taking it apart. As we discussed how to best disassemble it and then spray the individual pieces, a strange thing happened. We started to realize just how much we didn't like the ceiling fan and how dark the room gets at night. So we got to thinking, do we really even need a fan? Perhaps new lighting would be better? Just to entertain our meandering and somewhat distracted thought process I decided to grab a few fixtures we have in the attic. 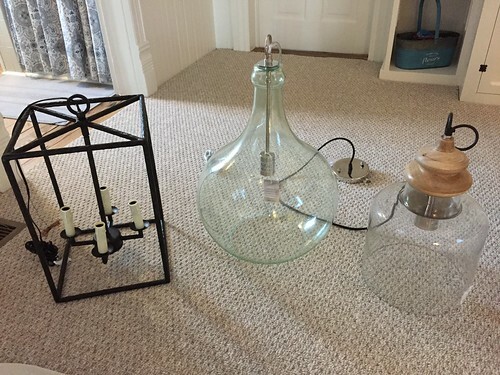 These are all fixtures I've picked up and plan to use in different rooms of the house, but each is just waiting in the box in the attic. So why not bring them out to play? While we didn't specifically plan to use one of these lights in this room, if one just happened to work well, why not give it an early home? We held each up to get a sense of scale and look in the room. The first is a Ballard outlet "door buster" purchase I initially thought we'd use in our eventual dining room, but I started to have reservations on whether it will be large enough above the table. Therefore I shifted gears and have now decided it will go near the front door in the living room to create a foyer of sorts in the room. But would this lantern work in the office instead? While I do really like the look, we decided it's just too tall. It would hang down too far from the ceiling and would certainly be a problem for anyone taller than about 6'2" that might walk through the center of the office. At the very least, it would feel like you were going to hit your head, even if you had a few inches to spare. 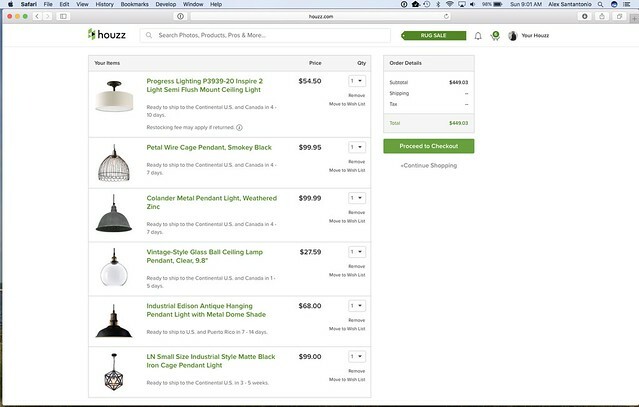 The second option we considered is a light I found on Wayfair many months back. It's an irregular wavy glass teardrop shape and I really love it. I'm thinking of using this in our eventual dining room over the table (replacing the lantern idea I originally had). For the office it has the look I am really going for, would put off some great light, but has the same problem as the first, it's just way too tall and would hang far too low in the room. Finally we gave our last option a try. I found this light, a pair of them actually, at HomeGoods last year. My original plan is to use them in our main hallway, but I really like how it looks in this room. The soft wood tone of the top, the clear glass and open bottom, it's almost perfect. But again, it's just a little bit too tall and I hesitate to split up the pair. 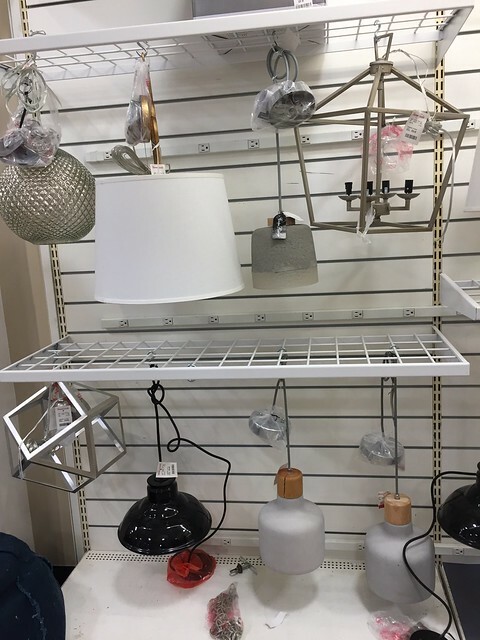 So my search for just the right fixture has continued but I've been unable to find just the right balance of style, price, and most importantly, scale. 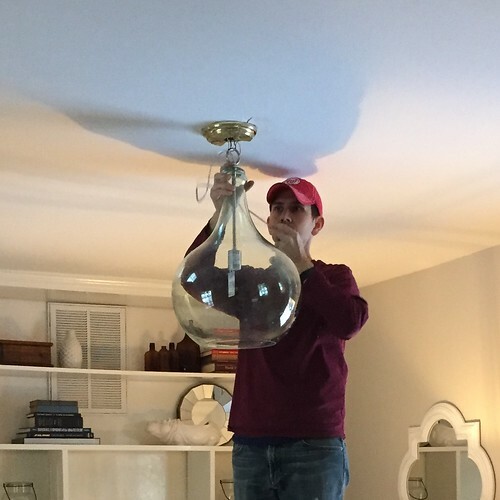 I definitely want a hanging fixture, but we'll need to keep it somewhat close to the ceiling. Max hanging height to the bottom of the light will need to be in the 12"-14" range to keep it far enough from people's heads. Given the size of the room, the diameter should be at least 14" across. This means a somewhat short and squat fixture. While we didn't have a winner from the fixtures on hand, It was a good exercise to hold these lights in place as it really gave us a better idea of what we might be trying to find. Over the last several days I've since been scouring various websites and thought at first we had found a great option (again on Wayfair) as this one ties into the look of the sconce style we used in the adjoining bathroom and will hang over the built in bench in the downstairs hallway. But after looking at dimensions, we realized it will be much too small for the room. I also filled up my shopping cart with potential options I found on Houzz. But the ones that Alex and I both liked aren't the right size either. In addition to searching online, you could likely find me stalking the HomeGoods aisles though regular trips to their usually rich with spoils lighting section. 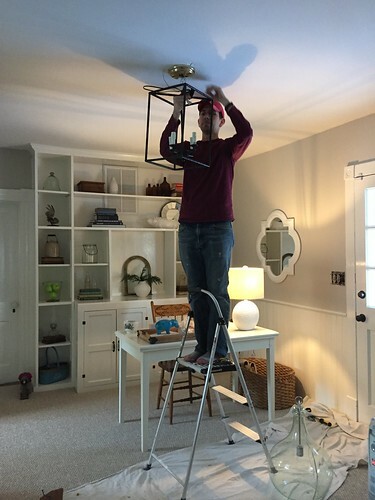 Their inventory changes on a daily basis, and I was encouraged when I saw the store about 20 minutes from our house had a new inventory of hanging lights. After careful inspection though, I couldn't find a winner. During a follow up trip to HomeGoods a few days later (I'm serious about stalking the aisles), I actually thought we may have found the perfect fixture. But it too turned out to be just a tad too small at only about 10" across. While we've been striking out so far, we're still holding out hope and will continue our search. However, we're also kicking around the idea of making something ourselves from a found or antique item. If I'm able to find the right sized antique wire basket (maybe an old oyster basket?) I'm sure we could turn it into a really cool chandelier. But for now, the hunt continues. What do you think about our direction? Should we go with something clear class? What about something more open like the first option we held up? Maybe a DIY fixture from a found antique? Or maybe just throw a drum shade up and call it a day? 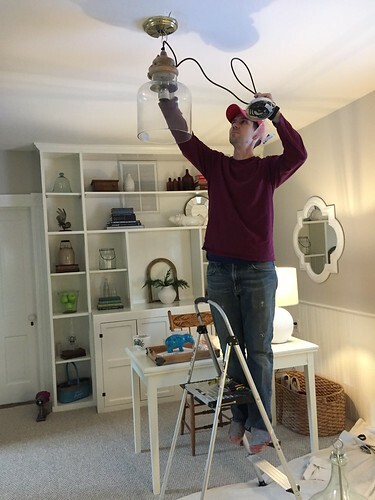 Have you seen a fixture you think might work? 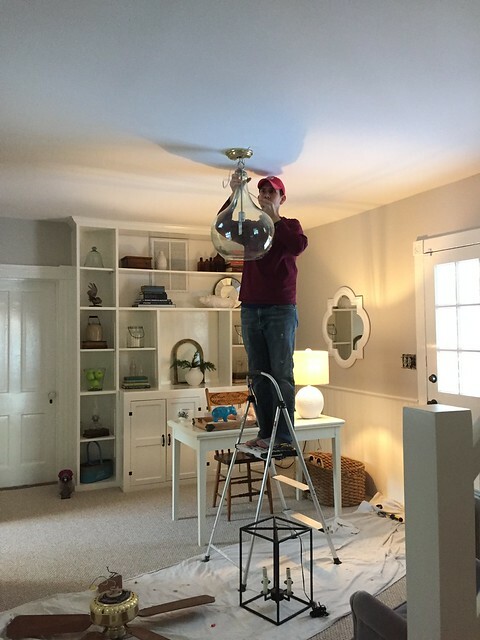 No matter what we choose, we think the room will be so much better with a light fixture rather than the fan. Besides, now that we have central air in the house, this is the coolest room in the summer, so we really don't need a fan. At the very least this whole exercise only fuels my apparent addiction to purchasing really cute light fixtures that I simply can't pass up. 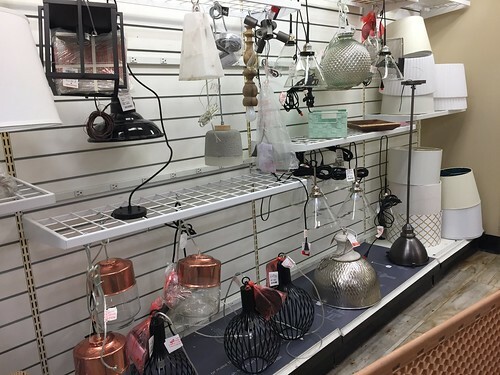 Whether I'm shopping for myself, for a friend, or for a client, there's something just a little bit magical about finding that fixture that's juuuuuuust right! Please remind me - what level gloss did you use for trim? Semi gloss? Hi Justin. 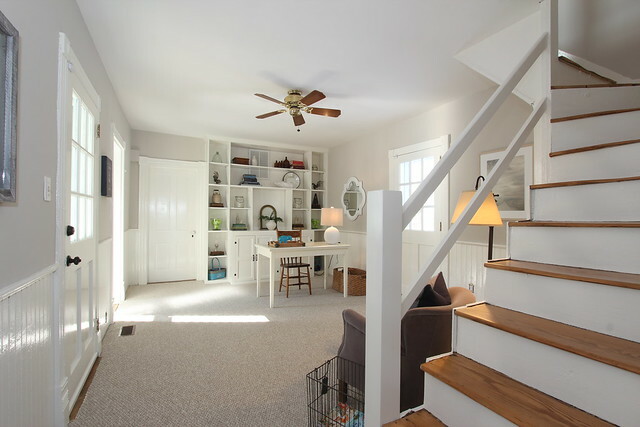 We used Benjamin Moore's Advance high gloss paint. I love the oyster basket idea! How about one of those suspended alabaster type fittings? See the swanky UK site of Charles Edwards lighting. Plenty of those In antique shops over here. Thanks for the suggestion, Sue. I just looked through the site and wow, do they have a lot of options! I don't recall seeing any of the alabaster type lights around us recently. Oh how I wish England was closer (or that we had a trip planned) so we could scour great UK antique shops. 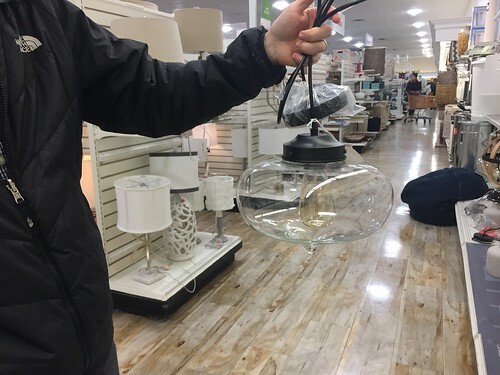 That last one at HomeGoods sure looked like a winner; too bad it was too small. Making something would be really interesting and unique and the way to go, since it's the entry point. Would that HG one work in another room? Then you could use it temporarily, until you can find something to use to create one. We didn't buy the one at HomeGoods and I'm sure it's gone by now given it was only $39.99! Great point, Brian, and definitely something to keep in mind. In our case though, when we bought the house we didn't have central A/C, and the office was one of the few rooms of the house that didn't have a window unit. Therefore it was pretty warm and stuffy, and definitely needed a ceiling fan. Since we've installed central A/C though (and have lived through a full summer to see how it's functioning), this room is actually one of the coolest in the house. Having the new system and seeing how it performs was a catalyst in our decision to ditch the fan for something that offers light and will hopefully look more attractive to boot. It seems like you're leaning towards clear glass, and I agree that is probably the way to go. To me, the metal of the Ballard pendant is a little distracting with the bookshelf behind it. It's a bummer that Wayfair pendant that coordinates with the bathroom scones and the HomeGoods find were too small. Fortunately, I think you could very easily (and quickly) DIY something similar to either of those. That's probably the route I would go. You could either use a pendant kit or buy the parts individually. 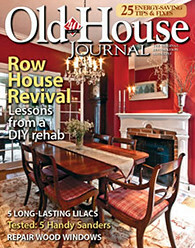 I noticed Rejuvenation has a 14" clear schoolhouse shade that might be substantial enough for the room. 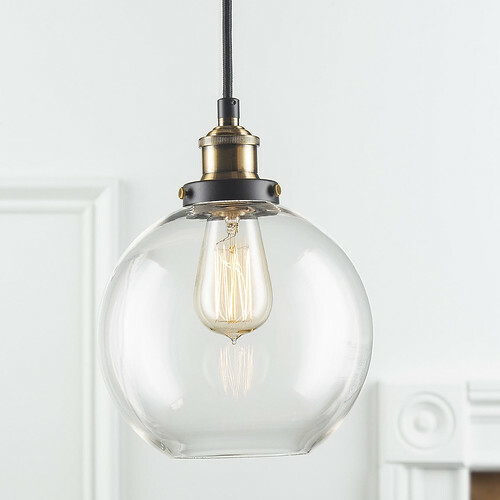 Edited to add: The McCarthy Glass Pendant at Pottery Barn might be around the right size, but it might also be a tad modern for your space.